Superb house 100m² + 70m² terrace. Residence on the beach, sea view, pool. Property 3: Superb house 100m² + 70m² terrace. Residence on the beach, sea view, pool. Villa - 1 bed ground floor apt. with private terrace,, sunny views. Property 6: Villa - 1 bed ground floor apt. 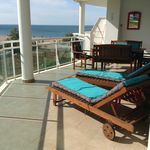 with private terrace,, sunny views. Property 36: ALMADRAVA - Villa for 8 people in ELS POBLETS. Almadraba Beach, a paradise by the sea. Property 40: Almadraba Beach, a paradise by the sea. March 2019 we rented the apartment of Henri Mac&eacute;, who turned out to be a gracious host with a good command of English. 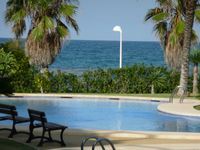 The apartment is situated on the ground floor of the Estrella del Mar complex with sea view, a nice garden, two swimming pools and direct access to the beach. It has a lovely big sunny terrace (until about 14.00 hours) and a small balcony at the back which catches the sun from about 15.30 hours. It is nice and modern with a complete kitchen, dishwasher and washing machine. Two of our daughters came over for a few days, so it was very nice having a separate guest room and extra bathroom! As we came by plane Henri arranged the rent of bed linens and towels. Nearby are restaurants and supermarkets. We paid a moderate amount for water and heating, as the apartment is relatively cold at this time of the year. Thanks Henri for everything! We thoroughly enjoyed the comfort, the sun, the beaches en we hope to be back soon.